Packers quarterback Aaron Rodgers walks off the field following the recent game against the Atlanta Falcons at Lambeau Field. 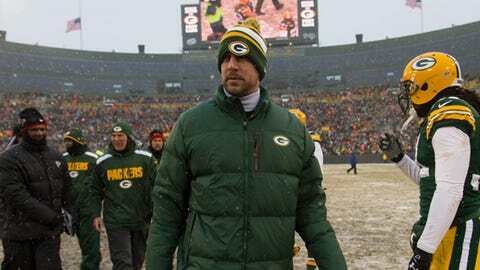 GREEN BAY, Wis. — There is a small sense of hope within the Green Bay Packers’ locker room that Aaron Rodgers will make his long-awaited return Sunday. But, after being without their star quarterback for the past seven weeks, Rodgers’ teammates are tempering their expectations a bit and remaining cautious in their optimism. Very little has changed for Rodgers this week. He’s still not medically cleared from his broken left collarbone, he’s still a limited practice participant and the Packers are still having to prepare Matt Flynn to be their starter. "Aaron is doing better," coach Mike McCarthy said. "(It was) a similar work pattern that he did last week. Threw the ball extremely well. Looked sharp. He’s getting better." Green Bay’s wide receivers are enjoying watching Rodgers continue to look more like his pre-injury self, but with a playoff spot just two wins away and no certainty that the former NFL MVP returns for those games, they don’t want to count on him being back. "He was out there doing some stuff, but obviously, we’ve said it since he’s been hurt, we’d want him back as soon as possible," Jordy Nelson said. "When he’s healthy, he’s the best quarterback in this game. To say it wouldn’t help us (to get Rodgers back) would obviously be a lie. "We want him back when he’s healthy and ready to go, and look forward to that. And hopefully, if it’s not this week, we can keep winning and give him another opportunity (to try to be ready for the following week)." It’s not that Nelson and the rest of the wide receivers are clueless about Rodgers’ status. Though they’ve done a good job keeping it secret, Nelson said "we have a little bit of an idea, just based on how the week’s going." He smirked when asked what feeling he got this week about Rodgers. "Got an idea that it’s day one of preparation, went out and ran some good routes, and got some good balls," Nelson said. Rodgers made improvements last week, but he was ruled out for this past Sunday’s game in Dallas because of what McCarthy said was "in the best interest" of all parties involved. There’s an ever-changing flow of beliefs outside the locker room of will-he-or-won’t-he-play regarding Rodgers. For the players, the information on Rodgers is usually much more straight forward. But not always. "I think each week’s been different," Nelson said. "You can get a feel for it. We communicate with each other and everything. It’s not our job to sit here and talk about Aaron and his situation and his body. That’s why we try to do our best to stay away from that. "You can just tell (if Rodgers is going to play or not). You’ve been around the game long enough, you know how things go. You just have an idea. Our idea might be wrong, to be honest with you. We have no idea when they’ll make the decision, and you can think one thing (and have the other happen)." Nelson added that the only time players talk about Rodgers is during interviews with reporters. James Jones has the easiest method of all in figuring out if it will be Rodgers throwing him the ball in the team’s next game. "If I want to know if he’s playing, I’ll just go up to him and ask him," Jones said. It took until the sixth game without Rodgers for Green Bay to pick up a win with a backup quarterback. After Sunday’s improbable comeback over the Cowboys, the Packers — despite a 7-6-1 record — will claim their third consecutive NFC North title if they win their final two games. Flynn’s second-half performance in the win over Dallas has given Green Bay confidence that it can beat the Steelers and Bears to conclude the season with or without Rodgers. But, obviously, they’d have a better chance if those games are played with Rodgers. "He’s the best player on our team, let alone the best player in the league," Jones said. "Our backs up against the wall; must win these last two games. We definitely must win this one at home, so we’re going to need Matt to go out there and do what he’s been doing, play the best game of his career and we need to get a win, um, if he goes out there." The end of that comment from Jones indicates that, at the very least, the Packers have accepted the possibility that Flynn remains their quarterback. "We just need Matt to be Matt," Jones said. "Matt is a gamer. We just need Matt to be Matt. Go out there, play your type of ball and let’s get a win. He don’t need to be nobody else but Matt." Flynn wouldn’t really mind sitting on the bench Sunday, though, as that would mean the return of Rodgers. "My mindset is I’m starting," Flynn said. "Obviously, we all hope that Aaron plays, but my mindset is I’m starting just so I can prepare myself." McCarthy wouldn’t reveal whether Rodgers has any medical scan scheduled this week, saying that it’s up to the player to discuss that information if they choose to do so. Well, Rodgers will speak with reporters Thursday, so perhaps there will be a more definitive answer then. "We just want him to get healthy, and hopefully, before the season’s over, he’ll be back out there," Jones said.